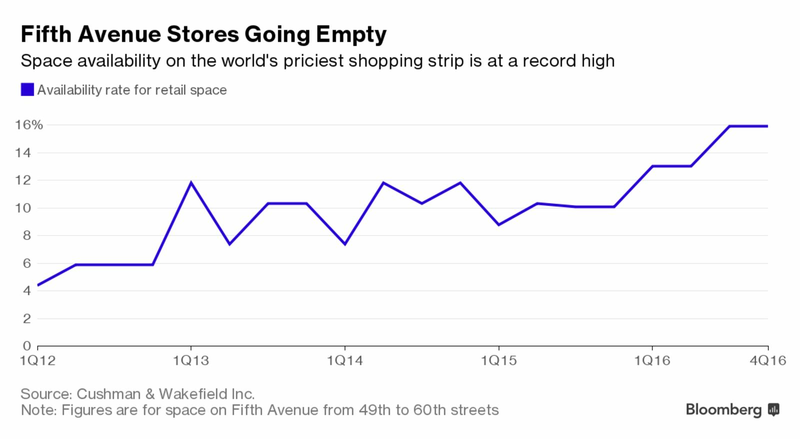 Tenant-improvement allowances haven’t been typical in the Manhattan retail market. But now the concessions, which can pay for anything from lighting and displays to a complete overhaul, are becoming a key component in some new leases, particularly for large, flagship stores in high-profile areas, such as Madison Avenue and Fifth Avenue, according to Steve Soutendijk, an executive director at brokerage Cushman & Wakefield Inc.
“We’re seeing tenant-improvement and concession packages that retail landlords never, ever contemplated before,” he said. The sweeteners signal that the balance of power is tilting toward merchants in Manhattan after a relentless surge in rents during the past five years. Landlords facing rising vacancies are more willing to negotiate with retailers, who have gotten battered by the rapid rise of e-commerce and have shied away from committing to costly, long-term leases. It's not as if this pattern is not both obvious or repetitive. Any of our long time followers should know that we tore GGP apart in 2007 and 2008, they filed for bankruptcy shortly thereafter. There are literally thousands of pages of research on this and many other companies in our paid archives from back then Paying subscribers, see Home > Research Reports > Real Estate > Commercial Real Estate. Here are some direct links: Our Commercial Real Estate Research sub-Category - Commercial Real Estate and Reggie Middleton says GGP will collapse & the type of investigative analysis you won't get from your brokerage house (554 KB) . This was a masterpiece (about 700 pages, all told. These historical pieces will be coming in handy, because we're back where we started from.